Denver's defense just made the Raiders reshuffle their game plan. Peyton Manning is no longer the Raiders' top concern, strange as it may seem. That title goes to Denver's league-leading defense — and all the stars on that side of the ball. “It’s unbelievable,” defensive end Justin Tuck told Vic Tafur of the San Francisco Chronicle. But the game film doesn't lie. 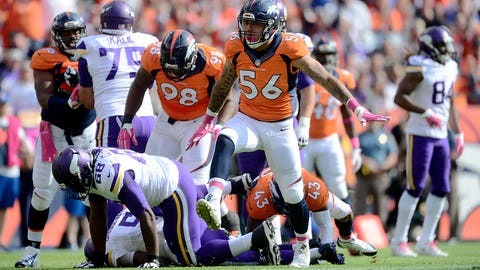 The Broncos are first in defensive third-down success (75 percent), third in the NFL with 18 sacks, and are tied for second with 11 takeaways. They surrender just under 276 total yards per game. Plus, DeMarcus Ware (25) and Von Miller (24) both top the league in quarterback pressures. Even that might not be enough. Denver is ready for a run-heavy attack with players like Darius Kilgo and Malik Jackson clogging the middle.